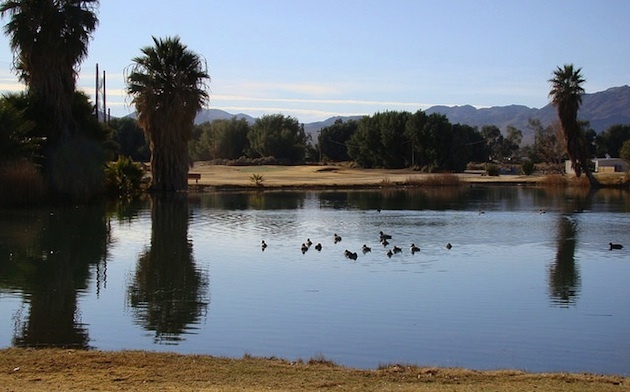 Stay at the only RV park in Twentynine Palms, California, and you'll get reduced green fees at the nearby public golf course. In order to survive in the Sonoran Desert of Southern California, it is necessary to have access to water and shelter. The Oasis of Mara provided that water, while the 29 palm trees surrounding the oasis provided the shelter. That oasis has evolved into the small city of Twentynine Palms, located 55 miles north of the more famous Palm Springs. This small city provides several attractions including Joshua Tree National Park, the Oasis Visitor Center/Museum, the Keys Ranch and a military base—the Marine Corps Air Ground Combat (MCAGCC). When you enter the city, murals painted on buildings draw your attention. Many of the murals were painted by the same artists who painted the murals in Chemainus on Vancouver Island. They depict early native history, first settlers, gold mining and desert scenes, as well as the military action of the 1st Tank Battalion in Iraq. The battalion was responsible for toppling the statue of Saddam Hussein, an iconic event of the 2003 Iraq war. 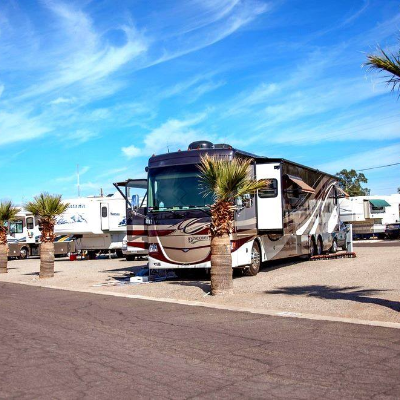 Twentynine Palms has a population of approximately 31,000 people but has only one RV park. 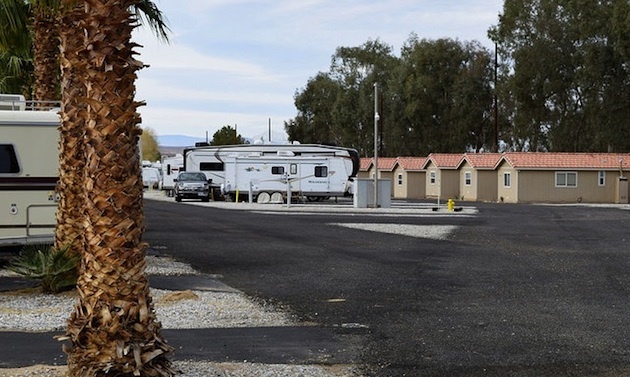 Because the city is not on a major interstate like Palm Springs, half of the residents of the resort are snowbirds who return year after year because of the amenities the park has to offer. There are 197 sites, with 30 pull-throughs and 26 cottages or park models which are fully furnished. The resort is a good winter destination for Canadian snowbirds and especially golfers. This is a full service park with an activities director who organizes happy hours and dinners, poker nights, bridge, barbecues, dances and other special events. One year we arrived just in time for Stuffed Potato Night, which made up the entire tasty meal. The park has adequate facilities including laundry, an indoor swimming pool, sauna, jacuzzi and fitness room. Tennis courts, shuffleboard and a nearby golf course are also included for the guests to enjoy. This public golf course is a very short walk from the resort, with the 8th fairway adjacent to the cottages. Opened in 1964, the nine-hole course was designed by Lawrence Hughes of the ASGCA and is privately owned. 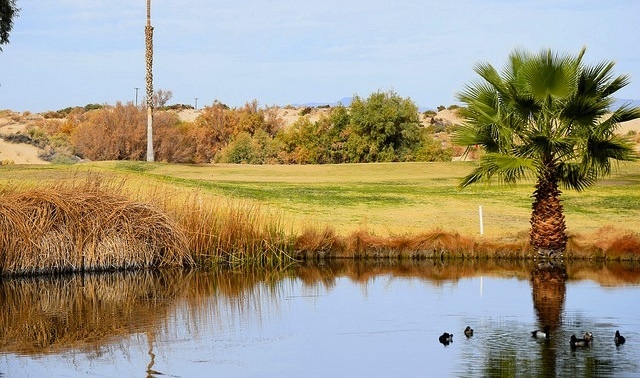 The course is set around two ponds, bordered by palm trees, natural desert vegetation and sand dunes. This is not a plush PGA course, but is designed for recreational golfers and offers a challenge to good golfers. As for playing the course, the fast running roadrunner bird is not a problem, but the sand dunes can be difficult. The course is 184 yards, par 36, with a course rating of 70.3 and a slope of 118 from the back tees. The longest hole is No. 5, a par 5 at 511 yards. The longest par 3 is Hole 2, at 182 yards over water. Hole 4 is the number one handicap hole, a par 4 at 401 yards. The greens are firm, undulating and fast. As with most desert courses, use the bump-and-run technique onto the greens. 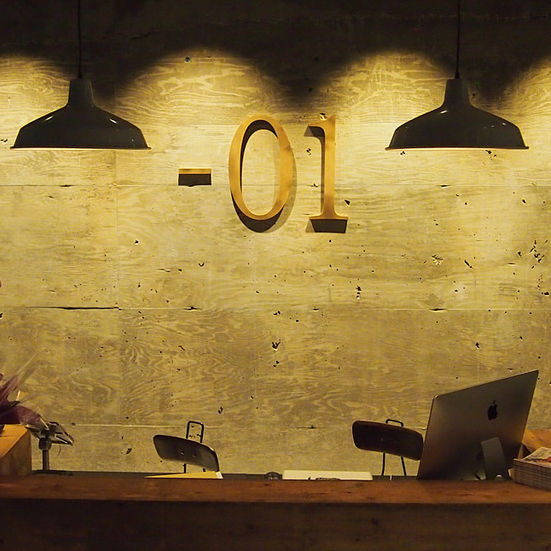 Roadrunner offers very reasonable rates, with punch cards of 10, 20 and 30 rounds, making it cheaper to golf daily. There is also a weekly golf scramble on Wednesday and men’s golf on Thursday. A monthly golf tournament is sponsored by a local merchant, who provides food and prizes. 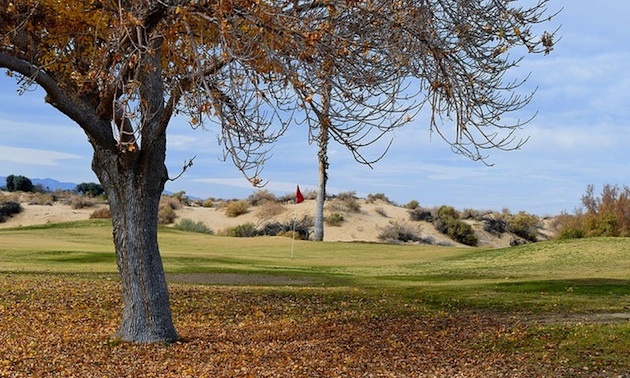 The golfing dollar definitely goes further at Roadrunner Dunes. This virtual reality indoor golf course sets a new standard for the game. 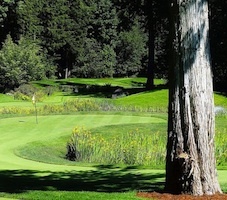 Just a short drive from Vancouver is the resort community of Cultus Lake, complete with two golf courses. Encore Resorts will provide a beautiful natural setting and all the convenience you desire. With several locations throughout the USA, Encore Resorts always impresses guests with a fantastic RVing experience.